This meatball recipe will star in your favorite red-sauce, and has a depth of flavor complex enough to stand-alone in a meatball sandwich or as a hors d’oeuvre. They are easy to prepare as long as you don’t mind getting your hands messy – because as your hypothetical Italian grandmother knows, the best way to work the meatball mixture is with your hands! With that in mind, have a couple of damp towels ready as you prepare this recipe. * Do not use extra lean meat. Fat is needed to help bind the meatballs together. 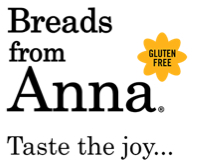 Toasted Bread Crumbs: You should never throw bread away simply because it is overly dry or stale (especially Breads from Anna products!) because stale bread is actually preferable in most recipes where bread is listed as an ingredient. So if you don’t have a zip-lock bag in the freezer dedicated to odds and ends of previous loaves of bread, please get one started. The bread crumbs used in this recipe are no exception, so this is a great recipe for those of us who like to stretch our food supply by re-purposing and re-imagining simple ingredients in novel ways. Breadcrumbs: Cut or tear pieces of your leftover bread into small cubes and place in a 350 degree oven for 8-10 minutes, or until toasted and crispy. Place toasted bread pieces into a food processor and crumble until you have reached your desired consistency. Our Classic Herb Bread Mix is a great option to use. Croutons: Click here for our crouton recipe. Meatballs: Mix all of the meatball ingredients except for the toasted breadcrumbs together in a large bowl, creating a fairly wet base. Once the meat is evenly mixed, add the bread crumbs to soak up to moisture and to assist in binding the meatballs together. If your meatball mixture is so wet it won’t hold its shape, add more breadcrumbs/croutons a quarter cup at a time until it firms up. The size of your meatball will dictate how much cooking is needed. The hors d’oeuvre portion size (pictured above) is a bit smaller than a ping pong ball. We were able to cook them perfectly using only a heavy sauce pan on medium to medium-high heat for approximately 15 minutes. Gently roll or flip the meatballs every four to five minutes, or when a nice dark crust has formed. If your pan is too hot, the meatballs will blacken too quickly, leaving the center raw. After 15 minutes has passed, take the meatballs off the heat but leave them in the pan. Remove one and cut in half to check doneness, or insert a meat thermometer (165-170F). If the center is not fully cooked, leave the meatballs in the hot pan and check again after five minutes. 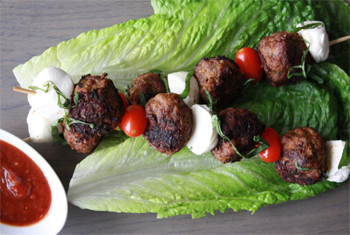 Hors d’oeuvre assembly: Alternate baby mozzarella, meatballs and grape tomatoes on a kebab skewer and serve with heated marinara for dipping. The slightly sweet tanginess of the marinara pairs quite nicely with the savory richness of the meatballs. Baking meatballs: The hors d’oeuvre sized meatballs cooked through in 15 minutes at 350; however, we preferred the texture, flavor and appearance of the meatballs cooked on the stove top. Larger meatballs or meatballs to be incorporated into sauces: If you are one who likes a large meatball or if you prefer your meatballs in a red sauce over spaghetti, simply brown the meatballs and throw them in the sauce – they will cook through as your sauce develops and add flavor.